Proposed Coaloa Project (17030 Sunset) | PROTECT PALISADES BLUFFS! Two proposed 49-unit apartment complexes within 90 yards of each other require the Palisades community to get involved! This project was disapproved by the West Los Angeles Area Planning Commission, and the California Coastal Commission refused to hear the developer’s appeal of the City’s denial. It is anticipated that the developer will submit a revised plan to the City in the near future. The proposed 17030 Sunset development violates the coastal bluff density and bluff setback provisions of the California Coastal Act Regional Interpretive Guidelines. The developer claims that the site IS NOT on a “coastal bluff,” and relies on the expert testimony of his geologist to make this claim. Since these two properties share the same coastal bluff (see the 1924 photo of these bluffs below), 17030 also IS on a coastal bluff. Per the California Coastal Act Regional Interpretive Guidelines, this project is limited to a maximum of 24 units (instead of the proposed 49) and must be set back 25 feet from the bluff edge. 17030 Sunset is the site of an active landslide. Studies also have shown the presence of hydrogen sulflide gas, for which no mitigation measures have been proposed. 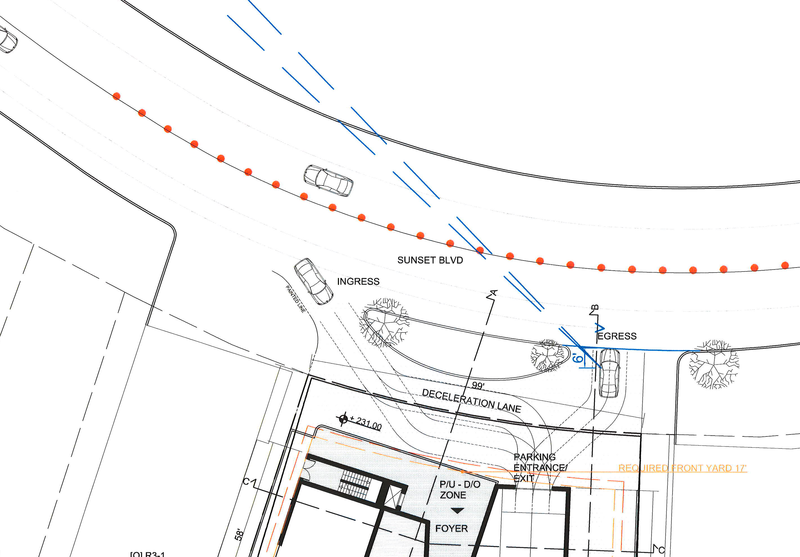 The traffic plans for 17030 Sunset propose that bollards be placed in the center line of Sunset Boulevard, which will increase the number of U-Turns at the intersection of Marquez and Sunset and at the base of Palisades Drive (as residents of 17030 and the adjacent buildings will be unable to turn left into or out of these properties). These bollards also will increase the amount of traffic on Arno Way as re-routed residents seek direct routes to PCH.